Today is a very exciting day for us, for two reasons. The first involves bacon. Strawberry and bacon. Remember a few weeks (months?) ago when we made these fun mini sandwiches? Well we were so taken by the strawberry bacon combination that we decided to make another sandwich with our new obsession, but this time, a breakfast one. Because breakfast needs some of that strawberry bacon love. The second thing that makes today exciting is that we are guest posting over at Chef Dennis’s site! We are so super excited and honored to be over there today! Not only does he serve up mouthwatering food, he provides indispensable blogging advice. So go and check him out! What a wonderful guest post. You have such kind (and true) words for Chef Dennis and this is a truly inspired sandwich! Really really intrigued. Strawberry and bacon... YUM!!! I love Chef Dennis! And these sandwiches...off to go check out the post! I want this sandwich righ now!! I do remember your mini sandwiches! These look even better with the eggs! Loved your guest post at Chef Dennis's site. What a wonderful sandwich! Totally loved it. Looks delicious -- I used to make a sandwich like this but I added a little pb too, lol! Heading over to check out the recipe! I would love to have one right now! This looks like the perfect way to start your day! How unique! I think this might be my first "savory" strawberry dish. I will check out Chef Dennis's site now! I think bacon works with everything. On my way to check out Chef Dennis! There's something about fried eggs that get me.... ever.. time. SO good! I love runny eggs on a sandwich, this looks so yummy! Wow...this is a gorgeous sandwich! I love all the flavours. How exciting! Um, I'm going to need a bite of this sammy. Going over to Chef D's site now. 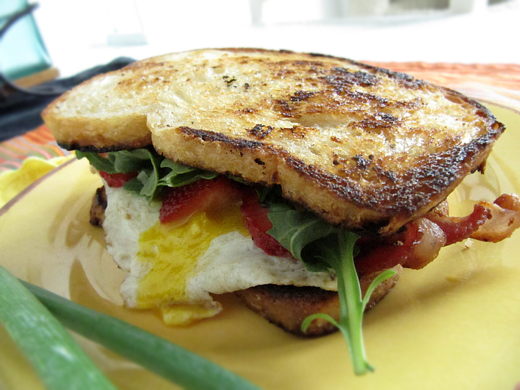 Bacon, egg and arugula, thats the combo I would love to eat every single day for breakfast! Mmm, yum. That looks all toasty and crunchy and delicious. I hope I have enough time to make this during the weekend! Great guest post! This is genius! You are so creative. What a clever combo, bravo!!! I would never think to put strawberries on an egg and bacon sammie! What a great idea! btw..you guys are so on point with your flavor combinations!! I left a comment over on Chef Dennis' blog, but this looks really delicious. It would definitely hold you until lunch! Oh, I missed this exciting post while I was at the beach and you are right it does rejuvenate a person. Congrats to you, don't you just love the Chef? Heading over to check out the recipe. Cheers! I did check it out and it looks awesome!! This is my kind of sandwich. Absolutely delicious! That sandwich looks fabulous! Strawberries and bacon, who knew? what a novel combination of flavors! individually, i love all these ingredients but never ate them all together in a sandwich. it does look tasty as hell! That is a cool flavor combo. Strawberries are good, bacon is good. Why not together? What an interesting combination! I'll have to give this one a try. Oh, what a beauty! Absolutely scrumptious. Great guest post, Jenn (and Seth! )...and I must admit, it was the first time I've seen the Higgs boson mentioned in a food blog! WTG! That sandwich sounds amazing! I'm yet to try strawberries and bacon...maybe I should try it this weekend! oh goodness, strawberries added to an egg dish. i'm in. this looks sinful. Congratulations! What an honor to guest post for Chef Dennis. Lovely breakfast. My husband would be in heaven if I made this for him! What a wonderful looking sandwich. While I never would have thought to put strawberries in the sandwich, I can tell it would be a great complement to the fried egg & bacon! chef dennis is amazing!! what a breakfast, love it! !